These findings may disturb some of you hard-core social networkers: A market research firm says 40 percent of tweets are "pointless babble." "Conversational" tweets came in second place and made up nearly 38 percent of the posts analyzed. Researchers say they went into the project thinking that Twitter was mostly used for self-promotion. With the new face of Twitter, it will be interesting to see if they take a heavier role in news, or continue to be a source for people to share their current activities that have little to do with everyone else. We will be conducting this same study every quarter to identify other trends in usage. Since Twitter is still loaded with lots of babbling that not many of have time for, you should check out the Twitter filter, Philtro. These guys can not only help you filter the noise, but will also be allowing you to store the tweets you are most interested in real soon. Here's another report on the state of Twitter, visualized by Gizmodo. The blog has a nice chart of what Twitter would look like if there were only 100 Twitter users in the world (The blog got its data from an upcoming book, "Visualized, the Information Atlas," by David McCandless). Half are classified as "lazy," meaning they haven't posted in the last week. Only 5 percent of users have more than 100 followers, according to the analysis. What do you all think? Is Twitter overrun with babble? I've sensed a lot of why-is-CNN-so-obsessed-with-Twitter? heat in the comments lately, so I'd love to know what you all think about this! I would say that it is more like 90% is inane babbling.. get outside people and actually interact with real people.. The entire idea of this revolution in networking sites is just a fad and will die off soon. Once most of the world grows up and realizes how worthless the information is on these sites. why is CNN obsessed with this mindless web 2.0 bull. They must have invested in them or something. I have been a Twitter user for about 2 years and I don't really understand what "point" this firm is trying to make. I use Twitter to the same goal as other Web 2.0 social networking sites – to exchange communication with people I actually know. This means I'm perfectly fine with some inane babble, because it's inane babbling from people I know, thus interesting at least to see that they feel the need to babble inanely (which can have deeper implications). Also, I'm perfectly fine having less than 100 followers, if my followers are people I know, who cares how many of them there are? To me becoming follower obsessed would ruin the point of it all. I feel like firms like this and media outlets like CNN spend so much time trying to quantify and analyze Twitter (and Facebook, MySpace, et al) that they miss the entire point. One could argue that 40% of all communication is inane babble. I follow primarly other I.T. types on twitter, and the signal-to-noise is very high, the majority of it being actual information, or interesting observations. Saying that Twitter carries no useful communication by looking at the unfiltered public timeline would be like standing in the middle of an intersection at rush hour and denigrating the people bustling about for not engaging you with intricate and meaningful discussion. Twitter is by definition 100% babble. What a waste of time. I never used Twitter and never will. I don't get it – the little odds and ends of my life are private and what helps define the differences in my life from that of my neighbor. I see Twitter as a vehicle for self-promotion babble talk; an extension of status updates on Facebook. I seldom touch the thing outside of sitting at home for a spell and chatting up some friends. Otherwise, I usually subscribe to the more meaningful informational feeds. They could be de-emphasized a bit. I used to feel bad about playing online games all the time 10 years ago. I never thought they'd trump the waste of time factor with these "social" networking sites. First of all, Twitter is more in the Web 3.0 || ITNG, but that is just semantics. I agree very much with Justin. To each is own, what works for one person may not work for CNN. Which the only way for CNN to view anything especially Twitter is through CNN eyes. Twitter is a free service that operates within its rules. Use it or don't, it isn't mandated that you do. If you cannot tolerate the babel or you think it is lame don't use it. Very simple. Heck I think 90% of what is on CNN is babel so I only pay attention to the 10% of information that interests me. I have a Twitter account and I use it for (1) keeping in touch with my close friends and relatives/family members without having to log into multiple chat clients (2) get up-to-date news or information directly from a handful of providers without having to subscribe to their news feeds or latest headlines. The point I am trying to make is it is up to the individual to subscribe to or contribute to the "babble" – the technology is so powerful and flexible that it can be used in so many different ways. People are still learning and getting a feel of it and it is too early to judge the usefulness of such social networking tools. You have the option to unsubscribe from the "babble" if it bothers you – no body is forcing you to subscribe to all the users who are on Twitter. What is nonsense for me may be useful information for you. Use it in ways that suits your needs. I do not know a whole lot about twitter. However, at my age it is not too difficult to put two and two together and figure out many things with common sense and the amount of life experiences I have been through. So, I would say, that mostly likely the "babble" we are seeing in twitter perhaps comes from the situation with money these days. I mean, one can unload their entire lifetime of random thoughts over a relatively short time using twitter as a free replacement for an expensive psychiatrists... This comment however, is not the result of just a random thought, or is it? I'm with Craig, when CNN started to insist that anyone who might be texting or even looking at their cell phone were "Twittering" (tweeting?) and insisting that it was some kind of "revolution" I too became suspicious that there was some kind of promotion for monetary gain for CNN involved. And for anyone to think that because you have a “Twitter following” that anyone really cares what you’re doing is so ridiculous it’s hard to believe anyone does this sort of thing seriously. It’s like those people who update there status on Facebook every 5-minutes. “I’m going to the store, back in 5”, “I’m back from the store”, “I’m reading a book”, “Now I’m not reading a book”, “I’m so tired”. Sheesh! 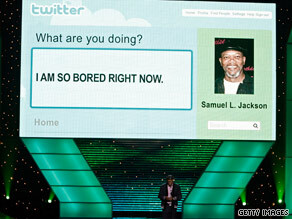 As for Samuel L. Jackson... "I AM SO BORED RIGHT NOW." Who really gives a damn??? Frankly Samuel… I don’t! I don't have a problem with people babbling, but when I see them doing it while driving their car...somethings got to go! I use Twitter. Occasionally and for the life of me have no idea why? Just to be 'in' the craze? Do you think they'll come a time when people are face to face Tweeting to each other instead of talking? I get a kick out of all the people who hate twitter. It's a website that facilitates a certain form of communication. How can you hate it? That's like saying that you hate telecommunications, because most of the people who talk on the phone aren't having interesting conversations. What I hate is that companies like CNN rely on Twitter as a source of news. It does seem that way more than 40% of the posts on Twitter are just people posting about the current Twittering Trends, but not adding anything of value. But don't hate the messenger. It takes very little effort to find the kind of content that you want to see on Twitter and filter out the rest of the crap. It almost seems like people spend their time seeking out bad things, just to complain when they find them. I use Twitter, but not for the usual reasons as described in this article. First, my account is locked. Only people I approve can follow my tweets. Second, I use Twitter as a convenient and cost-effective way to message friends and colleagues on new developments, departures, arrivals and time commitments. Let's face it: Twitter is a LOT cheaper than the ridiculous rates that mobile phone companies charge for texting! Finally, I only follow a few celebrities (such members of the Mythbusters) since they occasionally have interesting things to say. 40 percent?? Try 99.999999%. I could not care less if someone is "bored right now" or needs to "drop a deuce". It's use a a a ME-tool is just nuts. Anyone who has the time to waste on that is deserving. It could be a very important tool to use in certain situations , b ut how do you direct that message. A group of twitterers might actually have something worth following, but one off's ? Google has years of emails and posts from forums available, tons of info there, but who cares??? Those of you who think it's pointless don't get it. That's fine, it's not your thing. It's a nice peak into the daily goings-ons of people I already know. I care about what they say *because* I know them. So what if it seems like mindless chatter to everyone else? This is why it is so essential to give value when you are Tweeting. How is it that some people can proclaim that Twitter is a waste of time, yet sit at their computers on comment on a blog posting? Actually, I'd say "Conversational" is very close to "Pointless Babble", enough that they could be considered the same. This brings the total for Pointless Babble up to about 78%, I believe a much more realistic reading on the Twit-O-Meter. Add in Spam and Self-Promotion (clearly just other forms of pointless babble), and you start to peg around 90 or 95 per cent. That sounds about right. I agree with the commenter who said "isn't 40% of what CNN has to say just useless babble?" Celebrity "news" and junk articles (this one included) discussing the latest fads are just huuuuuge wastes of time! I'm surprised the number is so low, I'd have guessed at least 80%. CNN: TWITTER IS A FAD. Wow, really, 40% of all communication limited to 140 characters is babble? Jesus christ that's the most obvious statement ever. I would've guessed it's even higher. Are you guys taking money from Twitter for marketing purposes? Or did you just fall in love once you were forced to rely on it to report from Iran? Sounds like a reasearch firm tryng to get some press by weighing-in on something that's already getting press. To agree with Justin; if you don't know the people you're following and vice-versa, the content can't be much more than mundane. If you were to eaves-drop on the average conversations you hear in a cafe or train, I'm guessing it would sound...oh, I don't know... inane – go figure! This resaerch was done from a flawed position. No other conclusion could be reached. But hey, you got your name on the news and you've incited a bunch of people like me to stir up the disucssion even if it is to point out the ridiculousness of your premise. 1. Do mindless babbling, especially with status updates (I'm talking about you Facebook!). 2. Do what can be deemed "time-wasting", as they have other responsibilities they are ignoring (Procrastination).
" Samuel L. Jackson, what are you doing right now?" "I am so bored right now..."
Nowadays, it seems that the internet is being used differently then the principles it was designed for: Productivity, Collaboration, and Reference. Imagine if that 40% was used productivity? Peoples, our ever so precious bandwidth is being used up by mumbling idiots. Society would collapse if everyone was wasting time on Social Networking. These people have a negative effect on everyone as a whole. Unfortunately, it would be against all moral law, by, as to speak, "remove these guys form the gene pool". Just make sure all your "tweets" are as informative as possible, meaningful, and productive. Remember kids, don't drive and "tweet" at the same time. You endanger us all. I'm with Justin & Vincent. I use twitter, and have been for about 6 months. I follow a select group of news outlets (including BBC, NYT, NewScientist, Accuweather, NASA) who provide daily stories that I would otherwise have to seek out, and close friends who have twitter accounts. As with any social networking I follow these people because I like to see what is going on in their lives, and anything they post including the pointless babble is for the most part worth reading. If you would listen to the person talking about it in the same room it's just like reading it on twitter. While writing this my friend just tweeted "Going to another boring meeting! ", pointless babble to 99.9% of the world? YES. Pointless to me, NO. I gain a little insight into my friends life and the exact reason I follow him and have a twitter account of my own. To those who don't have a twitter account: you have no right to put me, or anyone else, down for having a twitter account. I indeed have a busy life and lot of friends, I don't by any means consider my twitter "following" to mean anything (it's only about 15 people anyway) other than the list of my friends who like to see what I'm up to once in a while. Your headline should read "ONLY 40% Babble" I would have guessed that twitter is about 99.9% babble. There is better technology out there now that offers the same benefits as twitter but without the babble – Mashable recently highlighted Obayoo – which has the live stream feature plus secure file exchange and chat options – but is geared more towards business and organizations. Twitter will fade to the background as more secure networking applications become available. More like 99.999995% of Tweets are completely useless. I know personally I very rarely have anything relevant to say. Including this post...completely useless and self indulgent. This post like 99.999995% of all other online comments do not effect society in a positive way ever. If anything at all tweets only give us a glimpse into how much time we are actually non-productive. What is babble and what is not is more of an opinion that anything else. I hate Twitter completely, so I would get rid of it completely and forever, but if other people enjoy it then I guess I have no reason to say they shouldn't be allowed to use and enjoy it. I agree I would have to say 99.9999% is babble. "Just had *ice* in my drink! #littlethings"
I also have a twitter account but don't follow anyone. I think I have a few followers. I actually use twitter as a convenient place to send my bicycle riding stats to.. I keep track of how many miles I ride, my average speed, and time riding. At the end of the mountain bike season, I will have a complete history of all my riding activity. That's what I use twitter for. WOW. Mindless people here. I'd say over 40% of the posts here are babble. I use Twitter daily for business. I have met new clients through Twitter. At a recent conference, Twiiter got me noticed by an exec at a large telecom. I've even was introduce to one my programmers through Twitter. It's not a fad. It's just another way to communicate. You all said that about email, social sites and even the computer in 1942. Heck, didn't a presidnet say in 1890's everything that can be invented is invented. Those people that are closed about Twitter obviously aren't innovators nor leaders. Twitter, Facebook and the other social sites are just a fad and will eventually die out or drop off. They give users a short-lived but exciting sense of something new...like dating someone new...but eventually the 'newness' wears off. How they will monetize over the long haul is still unknown. Once our economy picks up, or people are busier; they will find they have little time to follow others babble. What exactly is the point of twitter again? I signed up for twitter just so that I could "tweet" or whatever, saying that I was not using twitter. That post is still accurate and will be forever. If you want to know whats going on in the world, read a newspaper. If you want to know what your friends are up to, call them. Its simple. Also, most twitter users probably had a facebook first, right? Were facebook's status updates not good enough for people? Now people aparently need facebook AND twitter? I though facebook was pointless enough until this twitter deal came along. How stupid are we? I would say that nearly 100% of Twitter is babble because I really could care less what any of it's users are doing at any given time. There is nothing 2.0 or 3.0 about Twitter. Anybody remember those old relics things called Chat Rooms? You know, the type you used to be able to get on with your AOL account? That's all it is, one big chat room. An interesting thing about chat rooms that applied back then just as it does now, is that it is 100% worthless babble. Those who say there is anything useful coming out of that things are really just pathetic people who are ver lonely. I have no personal feelings about any specific social networking site, but, as an educator, find it sad that such a large number of young people (..and some not-so-young) spend innordinate amounts of time engaging in this form of "communication". I fear that reading, writing, and actually talking to other people are becoming passe. Yeah well phil, I don't think it's a matter of stupid....it's more a matter of sad, these are individuals that are still in highschool. And by stating that they are still in highschool, I'm not implying they're a bunch of teenagers still attending highschool. These are individuals that NEVER left highschool. The ones that have to feel like they're a part of a crowd, or always need the thrill of that little bit of juicy gossip, or pointing and laughing at someone who wore the wrong color shoes with their pants. I call those attention WH**es. These people must always be the center of attention, because in real life they don't have the guts to say half the things they say or imply behind a computer and are nowhere near in real life what they pretend to be on the computer. They NEED to belong to something that will get them the attention they lack in real life. At first, I was doubtful about twitter. I didn't think it could keep my interest. I was wrong. I am a recent college graduate who went to school in one city, now live in another, and studied abroad in Australia. Twitter allows me to share my experiences with those that I care about all over the world. A simple phone call or even email cannot accomplish the same goal with such ease. Also, you choose who to follow. So if you're sick of following someone – just don't. Its that simple. And Sarah Palin's are 100% gibberish! If you don't like or care about Twitter, don't use it. If you think Facebook is for people who don't have a life, then don't sign up for it. Simple. And I don't believe that Twitter is a fad at all. It's an evolving communications technology that will change and grow over time. I like Twitter AND Facebook. Leave me alone and complain about something else. Excuse me while I update my status! evolving communications technology....It is nothing but a glorified chat room. the kind AOL started years ago. They just thought up a way of making it a little more interesting by letting the world see everyone babble. The one thing that I am still failing to see is how "Twitter" is a new and evolving technology. All it is is a blog with a character limit. That's it. Bottom line. Don't be a Twit. Stop Tweeting. back at some point. I want to encourage that you continue your great writing, have a nice afternoon!